The death of a king 950 years ago today opened the most important year in English history. By the 5 January 1066, it was clear to all those circling him that Edward the Confessor was dying. 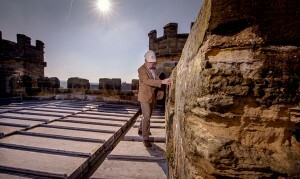 Roy Porter, Properties Curator for English Heritage in the South East of England, takes a look at the significance of this historic date, 950 years after the Norman Conquest. Frail and feeble, he had shown little appetite on Christmas Day and was not well enough to attend the dedication of his new Westminster Abbey. The Bayeux Tapestry – that exquisite piece of Norman propaganda – shows the haggard king on his deathbed, his body only held up by a servant, his wife at his feet with a cleric by his side and, ready to catch the crown from Edward’s drooping head, his brother-in-law Harold Godwinson. “I commend this woman and all the kingdom to your protection,” were, according to one source, the childless Edward’s last words to Harold. But was that as a caretaker or as his nominated heir? Certainly Harold wasted no time in taking advantage of the ambiguity – the very next day as Edward was consigned to the ground, Harold was crowned King of England. The suspiciously hasty coronation revealed the insecurity of his position. There were several competing claimants. Edgar Atheling, the young nephew of Edward and with the strongest hereditary right to the throne, Harold Hardrada of Norway, and across the sea and the greatest threat to Harold’s new reign, one William, Duke of Normandy. According to a later source, William was out hunting close to Rouen when he heard the news of Harold’s accession. Such was his anger that he returned to the city immediately, without speaking to anyone. The Normans claimed Edward had promised William the throne over a decade before and that while a recent guest of the duke, Harold had sworn an oath to support William in his claim. William would need “to claim his inheritance through force of arms”. 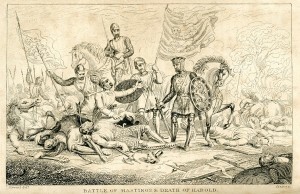 The stage was set for a year that would see four claimants to one throne, two invasions, and three battles, the last of which outside Hastings on 14 October between the armies of William and Harold proved decisive. Every man, woman and child knows the outcome of that battle. Today, 1066 is the most famous date in English history and the story of that arrow in that eye is enshrined in the nation’s consciousness. We still live with the legacy of that year. In the early 12th century, the battle was described as “a day of destiny for England, a fatal disaster of our dear country.” In light of the profound changes ushered in by William the Conqueror’s victory, it is easy to see why such views prevailed. The English political elite and major landowners were completely displaced by followers of William, the English language was relegated to secondary status, the country’s subjugation under its new rulers was physically marked by the introduction of castles (many of them in the care of English Heritage today), and the traditional links which bound England to the Scandinavian realm were inevitably eroded in the reigns of kings who held territory in Western Europe. ← What Does the Science Really Say about Sea-Level Rise?